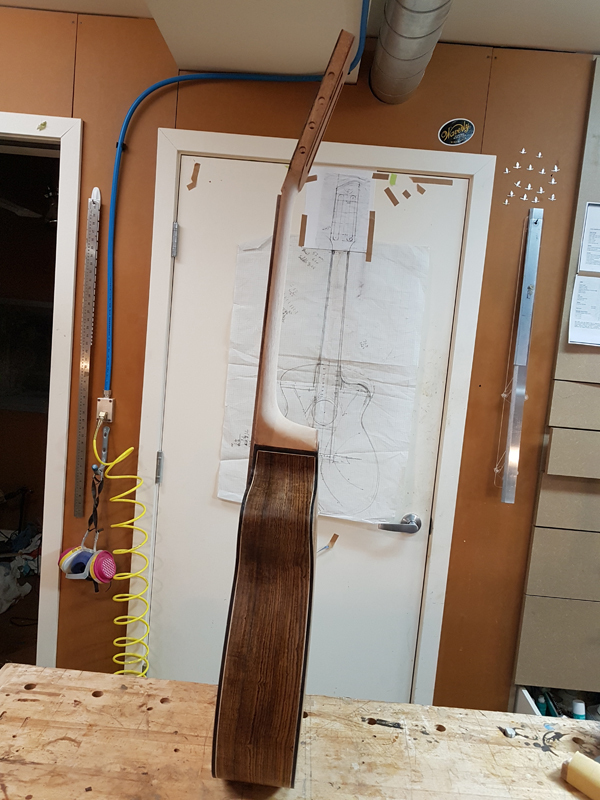 I am ready to start cleanup and finish prep on this Bocote\Lutz spruce 8 string crossover commision. The 2 extra strings will be bass strings. I will have to play to see how low to go. The player would like to go down in fourths from the low E. I know I can make the 7th string a D and the 8 string an A and have it sound good with still useful strings. 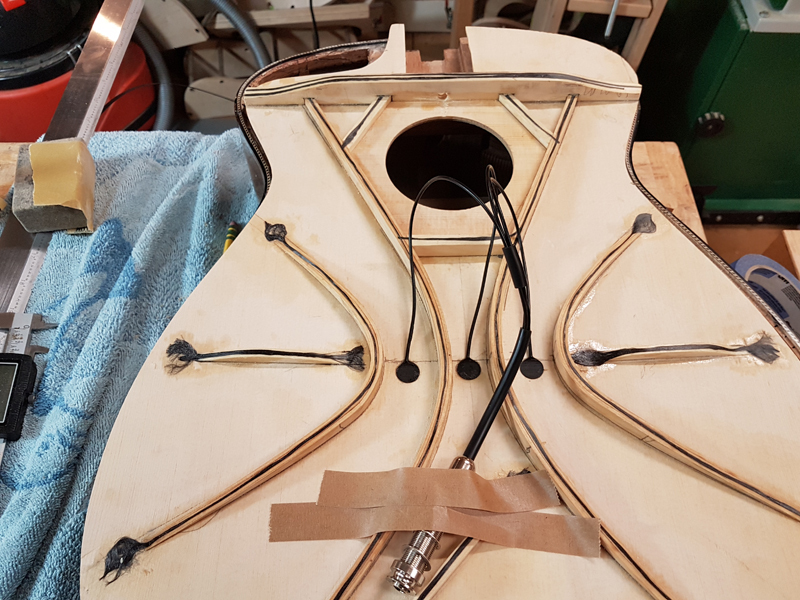 I started with the Gore medium size guitar and adjusted it for 8 nylon strings. 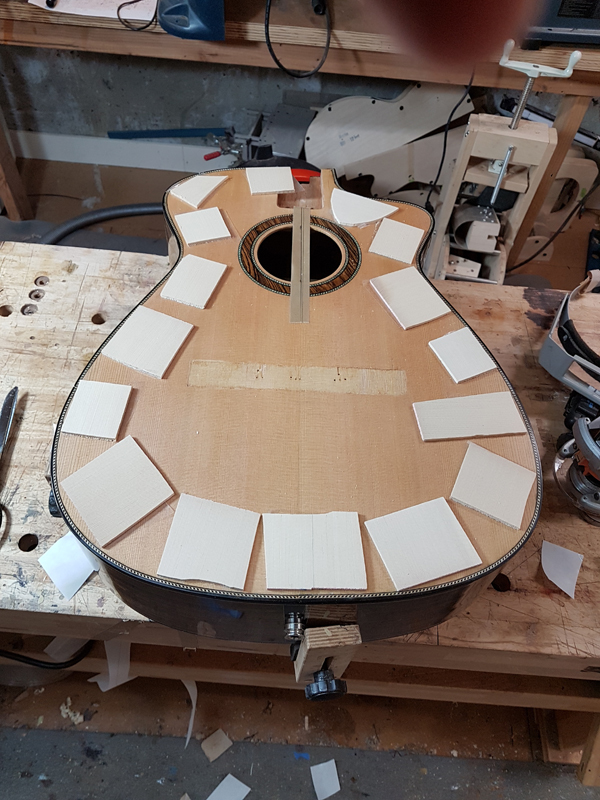 The guitar has a 14 fret join, so I made the scale 660 mm to push the saddle down a bit. 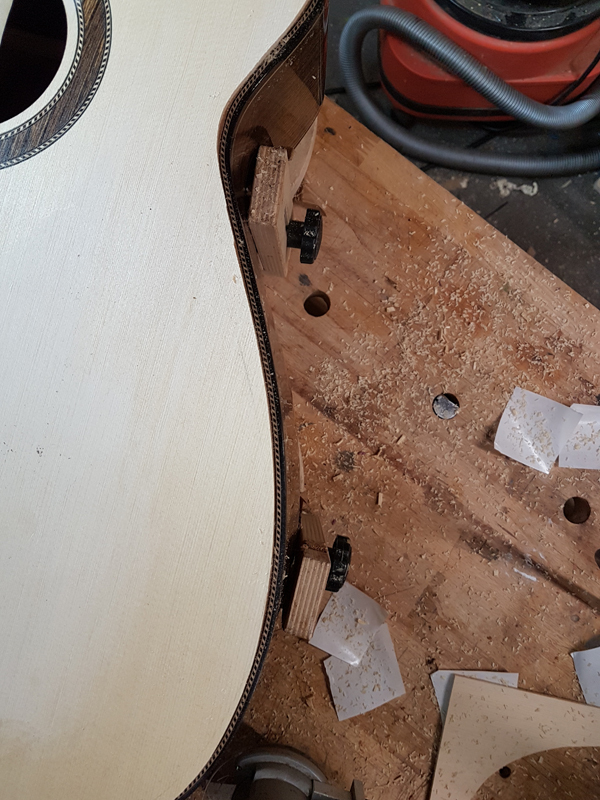 The neck has close to steel string spacing on a 55 mm nut and typical classical spacing on the bridge. 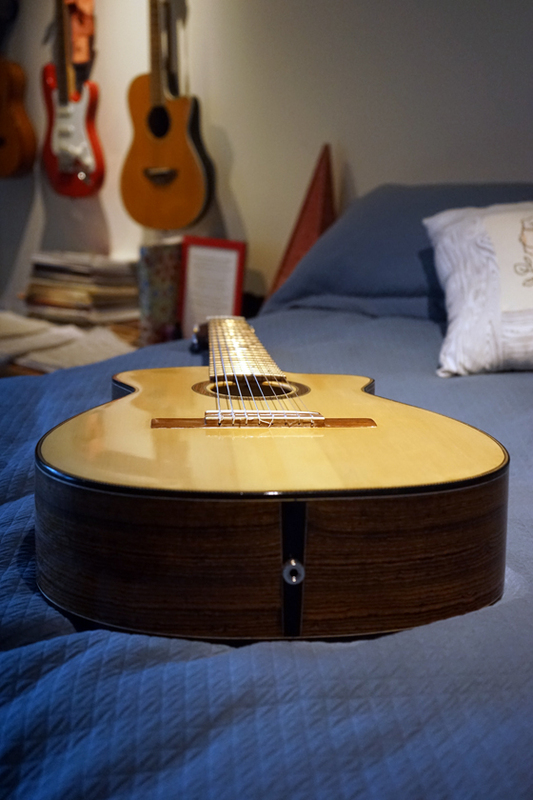 The guitar will be played more like a lead guitar (thus the 14 fret join) than a classical. The player wanted the nylon string sound. It certainly is a somewhat unique instrument. I am interested to hear what it sounds like. I will install a K&K pure pickup, as it will be used in performances. 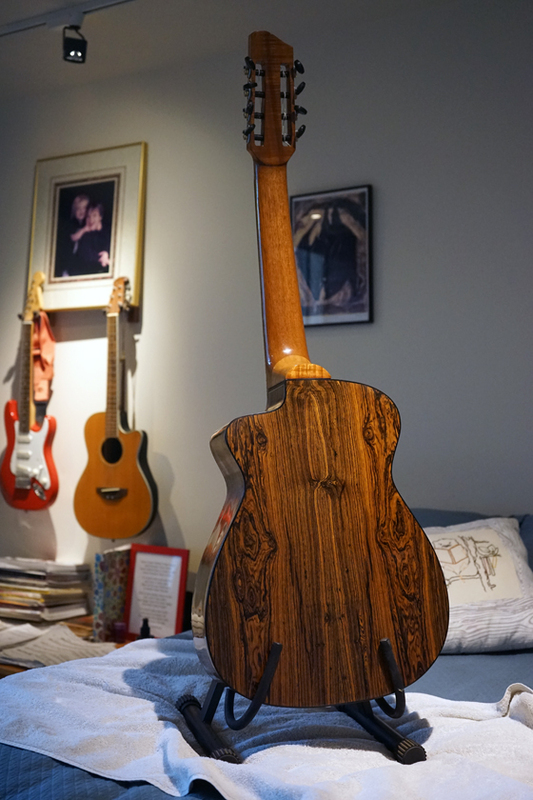 I love the design, love the bocote/lutz combination, but I especially love the really blonde colour of the neck timber. What is that? I matches so well with the spruce, contrasts nicely with the bocote. It is great that you are getting commissions for interesting and unusual designs. But it must be a bit nerve-wracking to be in uncharted territory on a customer's job. I only build for myself - so if my experiments fail it is a private affair. 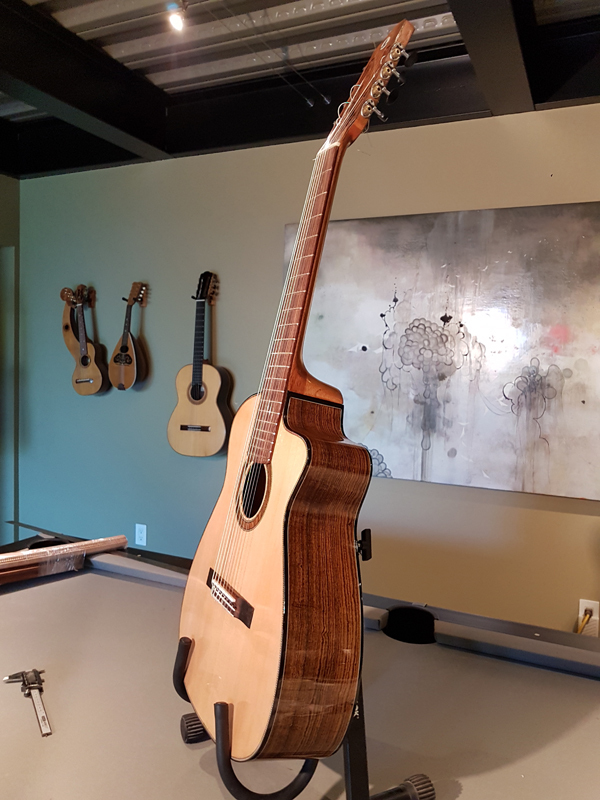 Thanks Mark, The neck wood is mahogany, I think the light hit it funny in the picture. I build for a customer, but take no deposits. My thoughts are I will try and if I succeed and they still like it they can buy it. If not well it was just like a private build. It has been awhile but she is all strung up. I still need a proper set up but she sounds good. Currently I am using .050" and .060" Nylon core silver wound strings for the sub base. They sound good tuned to a D and a B. I have ordered .054" and .064" strings to try and see if I could go down in 4ths from the E to B and F#. 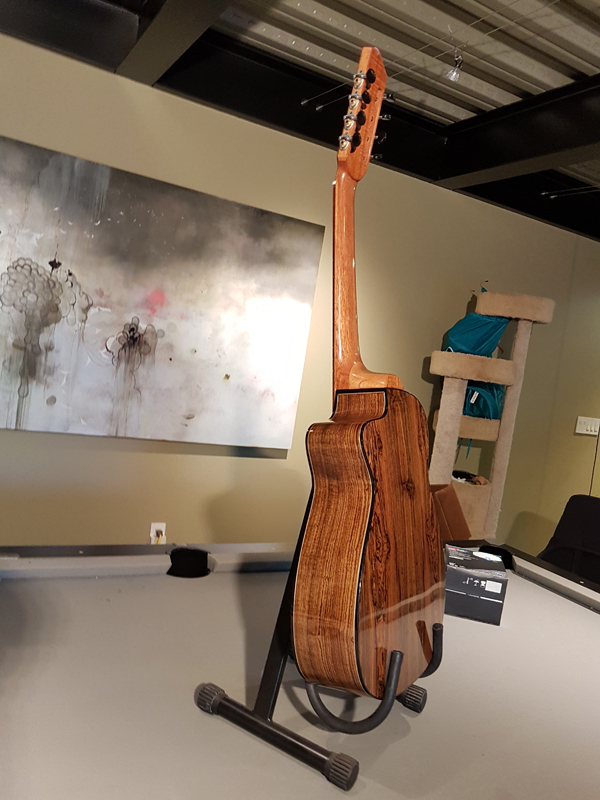 The finish on the body is post cat Royal Lac on system 3 silvertip epoxy pore fill and seal lac. 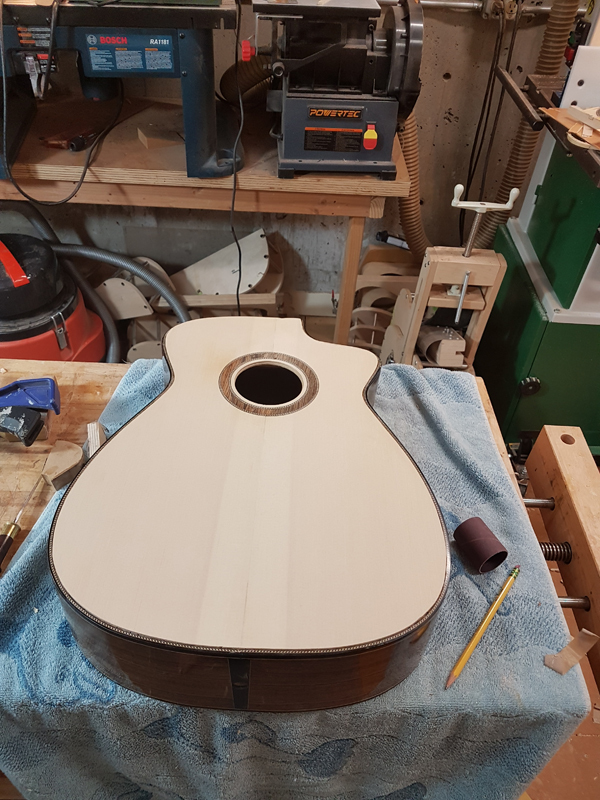 The neck has a gluboost fit and finish CA pore fill -> seal lac - wiped on Royal Lac. As always nice looking work John. As always I am interested in the falcate bracing. You presumably beefed it up a bit for the extra strings so I wonder what height you ended up with? I wonder if you have had time yet to look at resonant frequencies, and perhaps particularly with this one, the bridge rotation? Thanks, The main falcate braces are 10 mm at their thickest and the secondary braces are 8 mm. I used the classical top number in the equation to get the thickness. Right now I eye ball maybe more than 2 degrees but much less than 5. My saddle still needs to come down a couple of mm so I will measure the angle after I do the setup. The air and top are 80 and 170 Hz. I decided to try for a lower resonance because I had two additional bass strings. I was shooting for 180 hz but the big bridge dropped the tops resonance. 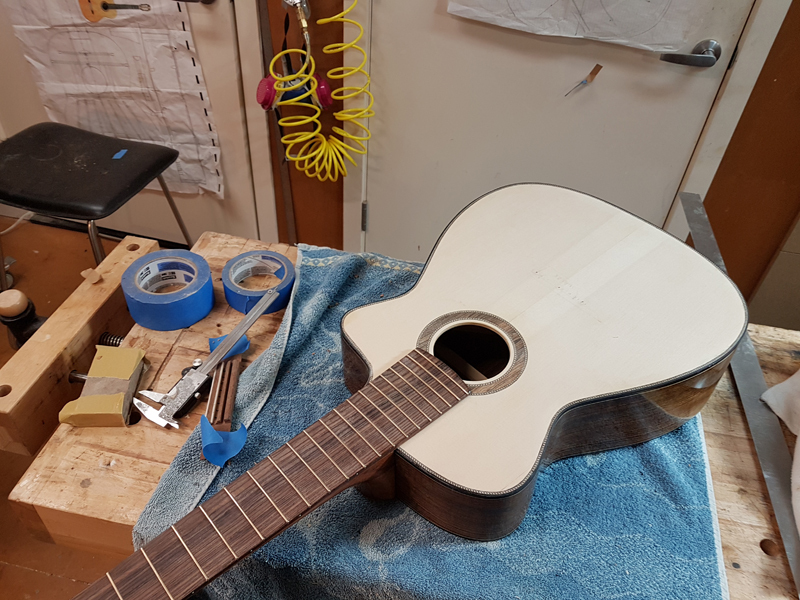 The treble string sounds OK now but the guitar has K and K mini pure pickups, so if trebels ends a bit weak the player can bump up them up. The Bass notes are powerful. Looks great. Elegant, but also looks very powerful. It is great that you have mastered the build techniques now, so that you can focus on the challenges of the unique new aspects of each build. Love your work! How were you able to drop the main air that low? I'm primarily building with a Hauser plantilla and my air resonance is usually around 102 HZ and I would like to drop it some. Looking at Trevor's sensitivity analysis it looks like sound hole diameter and back stiffness are my knobs, was this you approach? I'd like to get to 95 Hz, maybe 90 Hz if possible. I got the lower air by having a deeper guitar mostly. 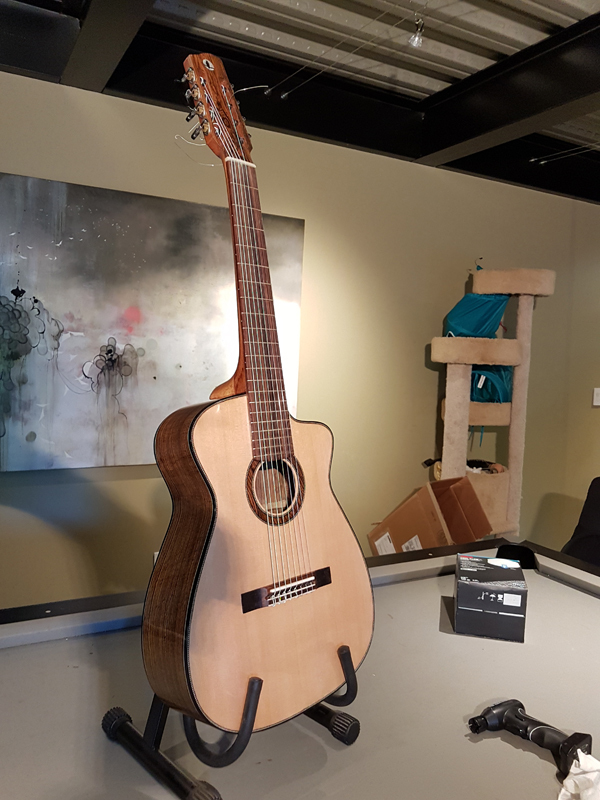 Unfortunately although I liked the sound of the first top, I did not feel it was holding up OK to the string tension. There was more bow behind the bridge than I felt comfortable shipping. 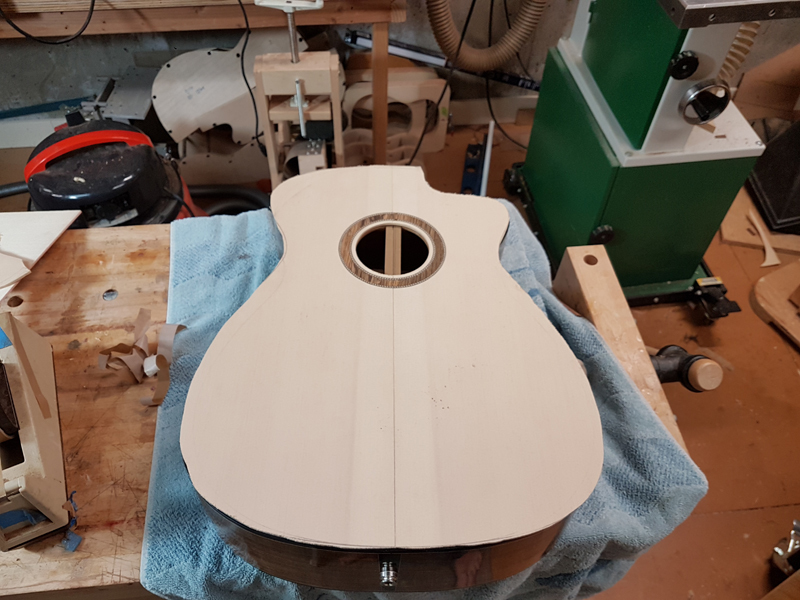 So instead of delivering the guitar I told the customer that I was not comfortable with the guitar and putting on a new top. 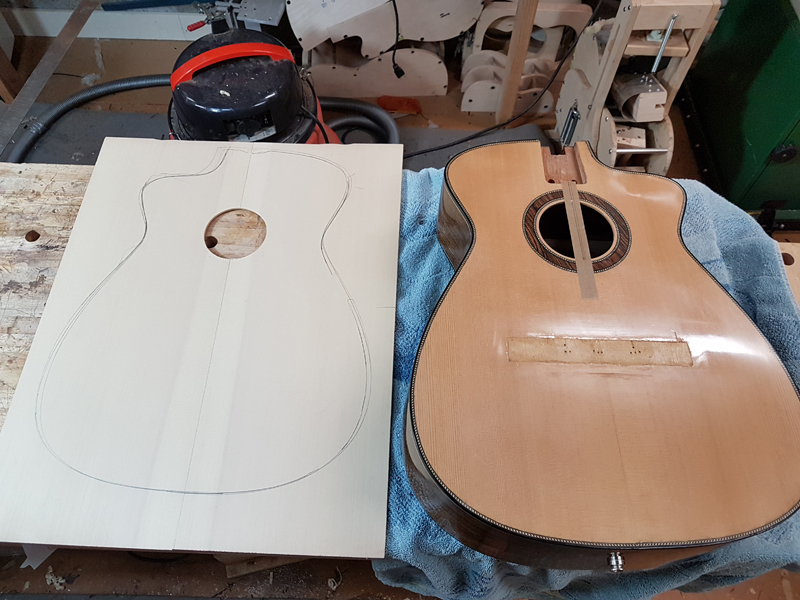 I decide to use John Greven Guitars retop method. That is replacing the top leaving the binding and purflings intact. I was not so worried about the binding and purfling rather I wanted to avoid refinishing the rims. I joined a nice set of European Spruce and installed a rosette. The Rosette is much like on the original top rope purfling and a wood ring. 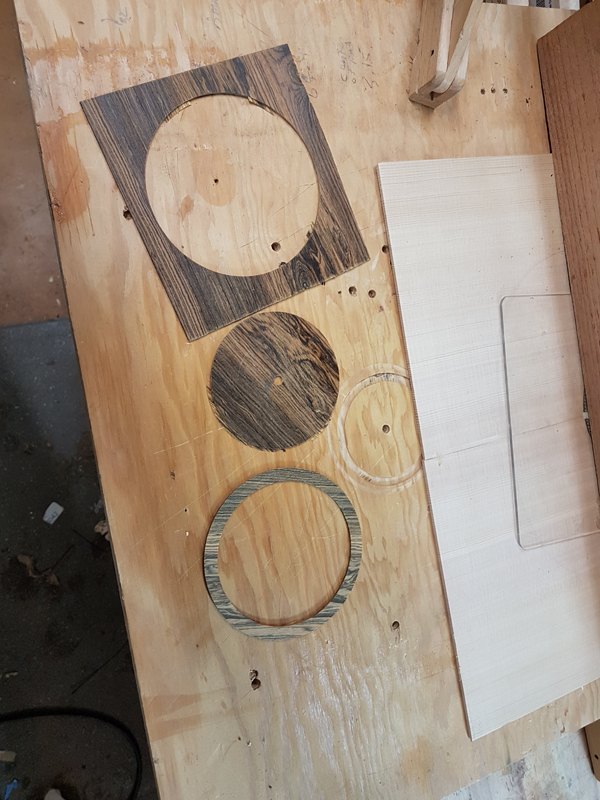 However I have been unhappy with the my results with the router, so this time I used an LMI Circle Cutter to cut the inside and outside of the rosette. I then use the router to make the actual channels. 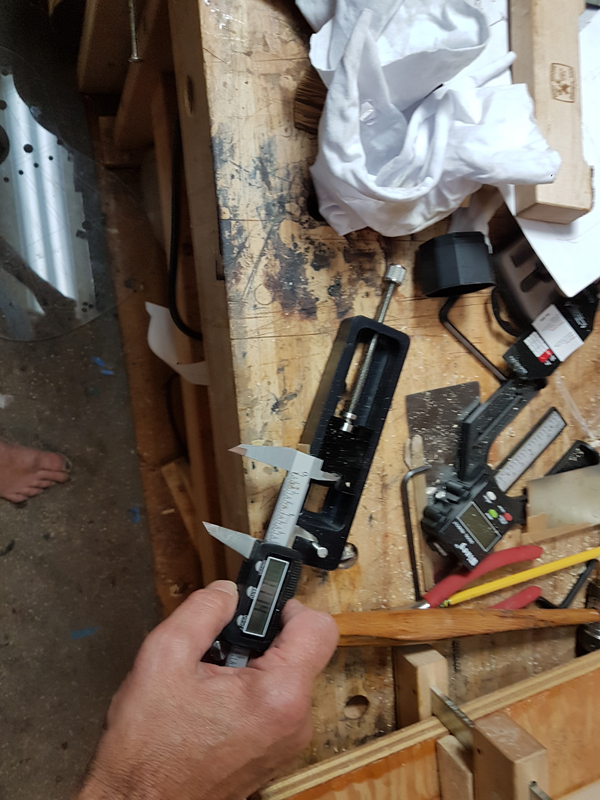 I very carefully set the tools to the correct radius. 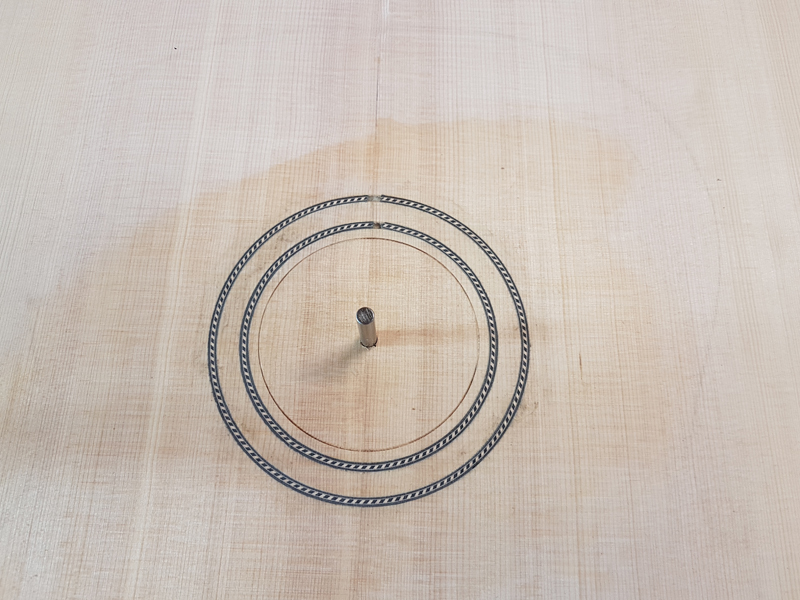 I cut the rosette ring out with the router. 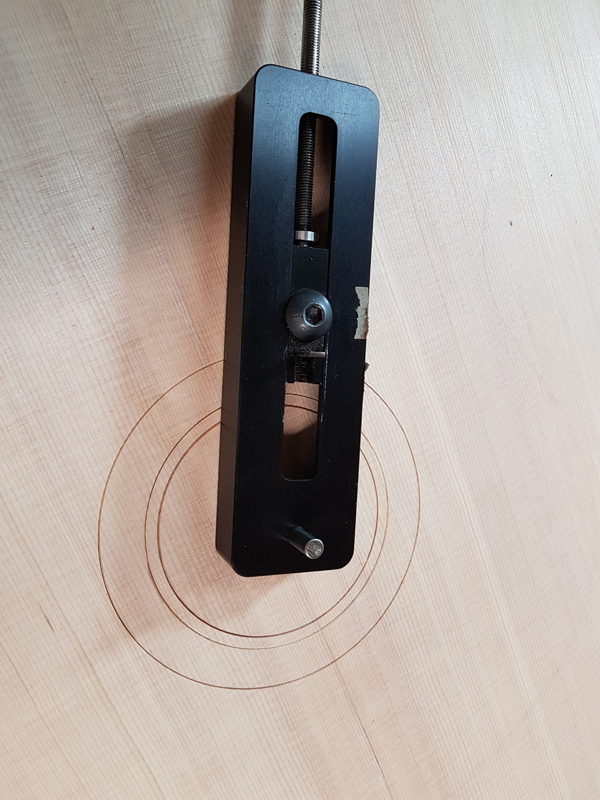 I cut the inside and outside edges of the rosette with the router set to the thickness of I used to route the channel in the top. I then turn it upside down and send the back of the blank to the ring drops out. 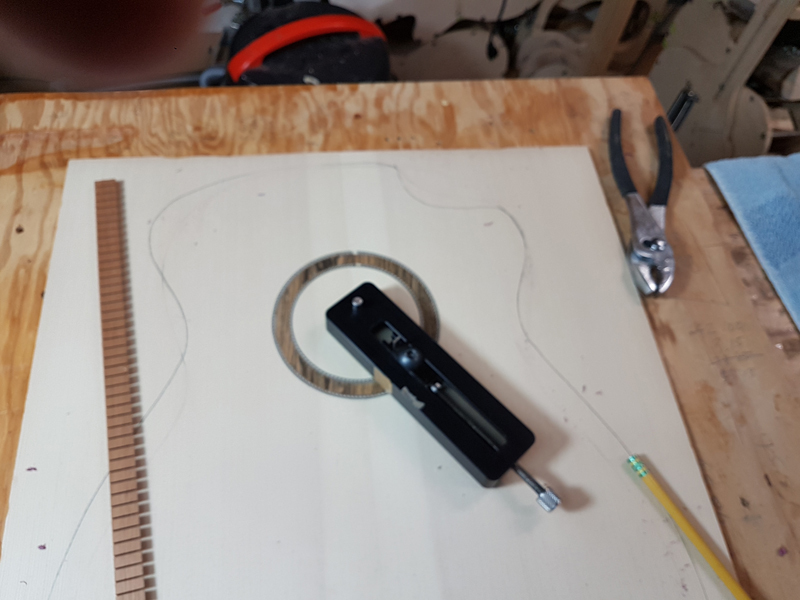 I also used the LMI Circle Cutter to cut out the sound hole. I used double stickum tape, to tape on a set of spacers and the new top in position to the old tape. I do not have pictures but with the top taped in place I used my binding jig to route the new top to just to the inside of the purfling. 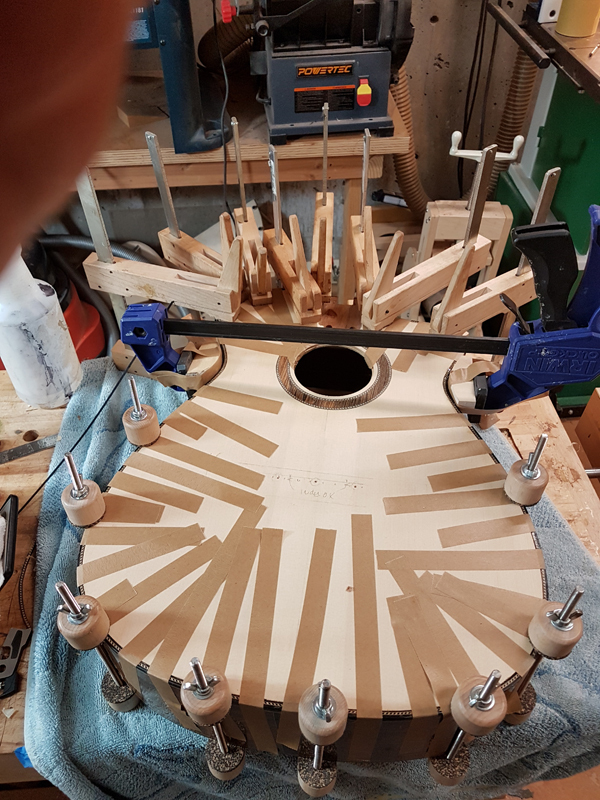 John Greven uses a router to route out the old top right on the inside line of the purfling. This would have been ideal as you get a nice new clean ledge on the linings to glue in the new top. 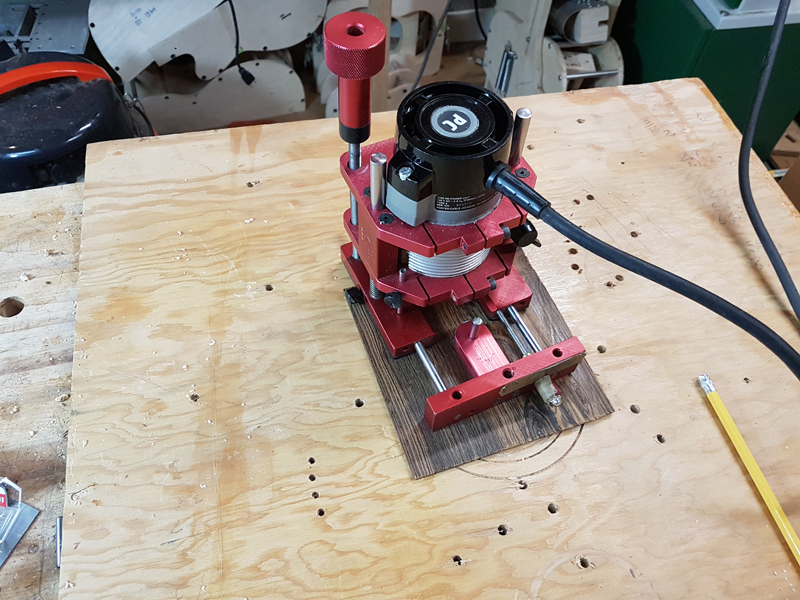 But my router jig would not go deep enough in, so I used my fancy veritas binding tool to cut through the top on the purfling line. Not shown, but once the top was cut all around and removed, I used a saw a bit inside where the linings were to cut out the top. I then used a heat gun and popped off the remaining bits of top to the purfling. 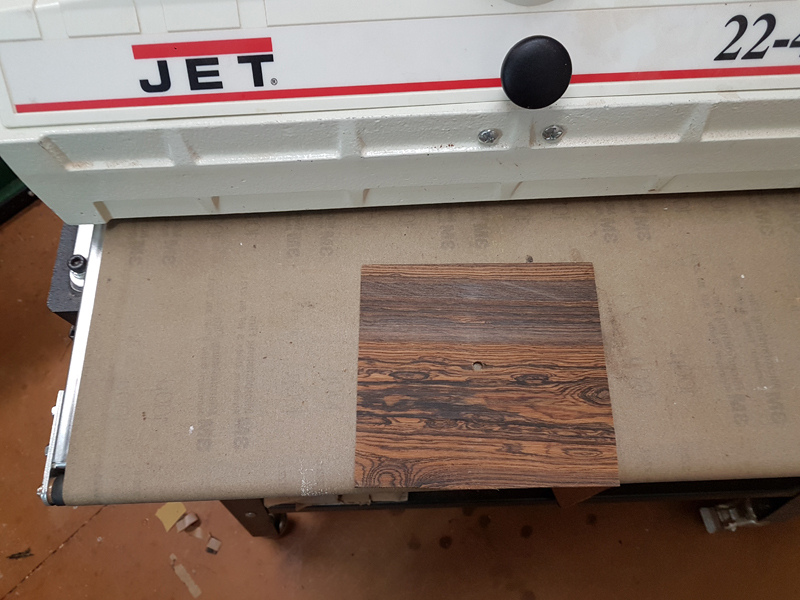 It all came off cleanly but this is a step I could have avoided with a router with the right jig. 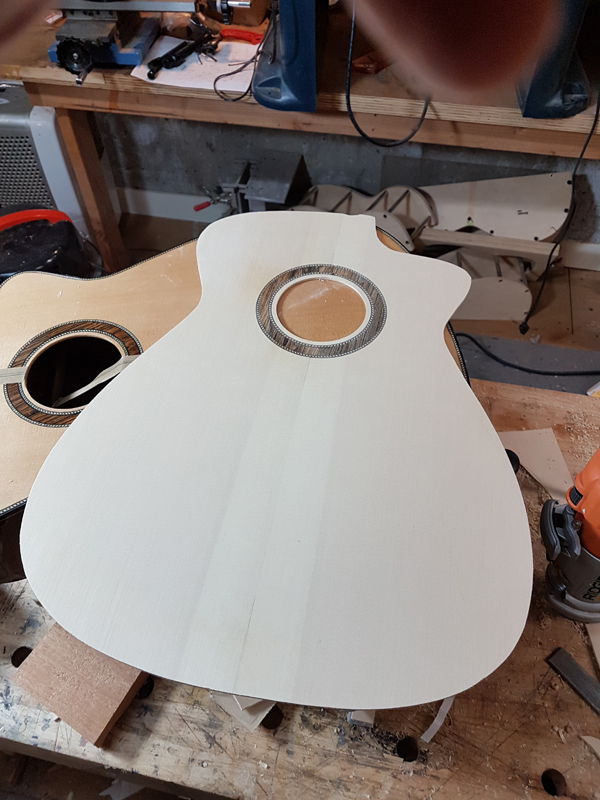 With minimal sanding the top fit in the body. So I braced it and used a new bottle of titebond hide glue to glue it in place. This top is a bit thicker than the last at 2.4 mm and the falcate braces 1 mm or so taller than the last top. 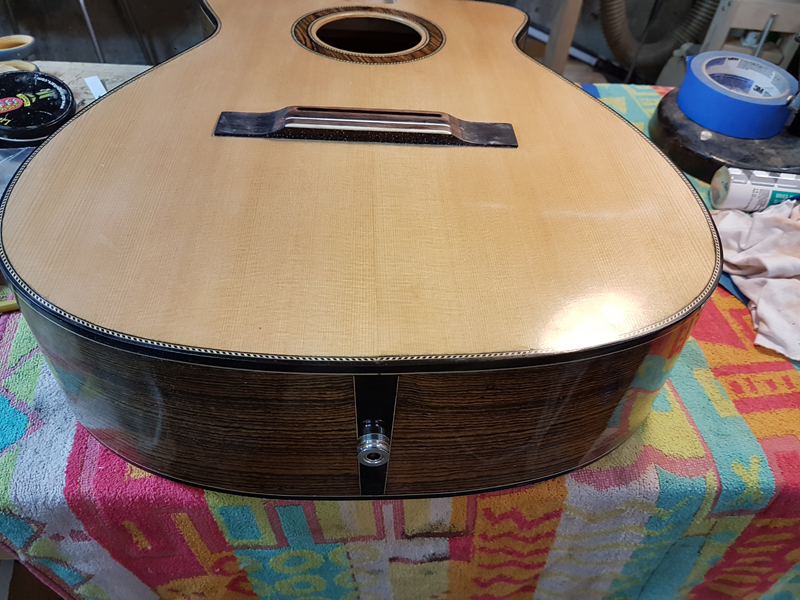 The rims are still a bit flexible so I mostly glued the top in place like binding a guitar. I did put a few clamps around to make sure the top was clamped to the linings. The new top is a bit proud, so it was easy to clamp down. So far life seems good again. John that is amazing result how you changed the top and retained the binding! I am impressed too. 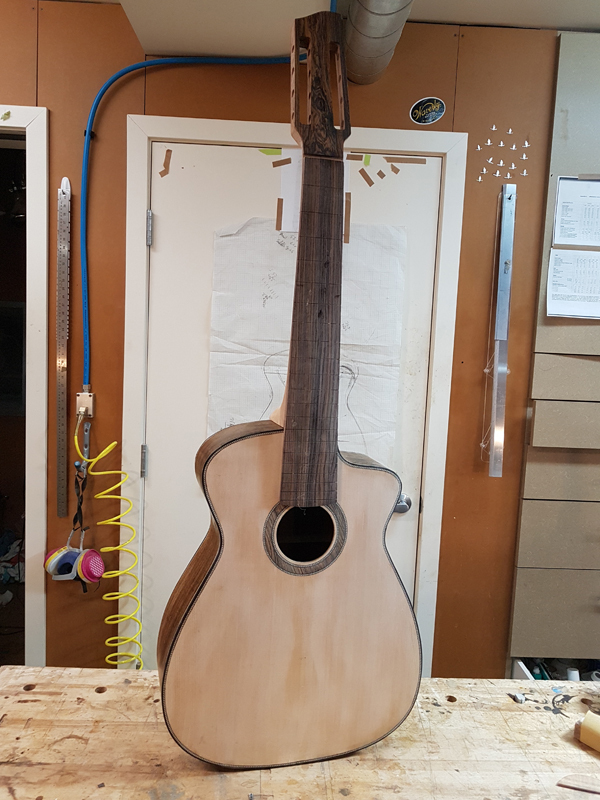 I just did a re-top job on one of my previous builds and my method was much less refined, and took way more effort than that approach. Looks like you are back on track with this creation John. Nice work on that re-top John. Speechless. 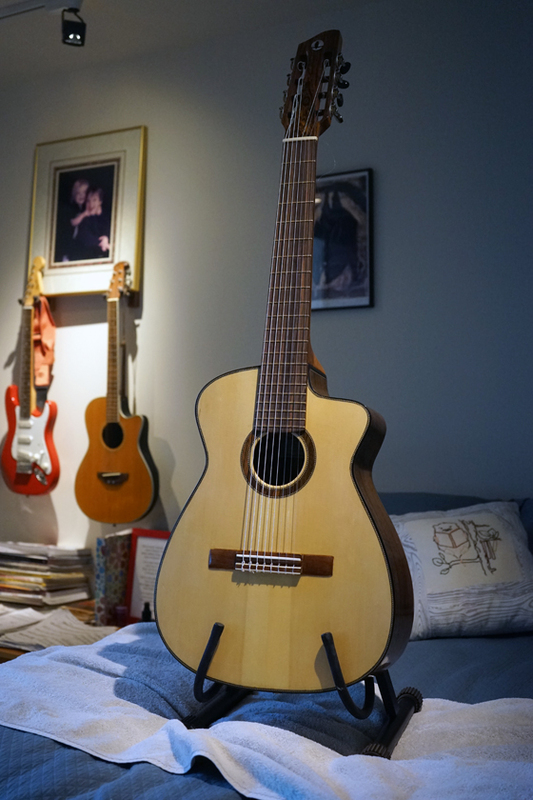 8 strings... then that retop. 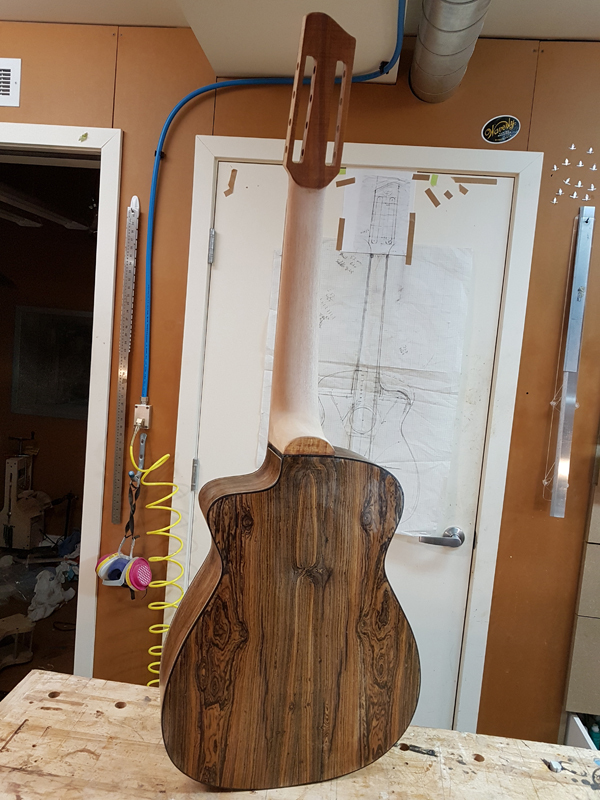 Thank you for the previous kind comments I am FINALLY ready to deliver this guitar Saturday. I finished the top with post catalyzed Royal Lac sprayed on top of a shellac wash coat. 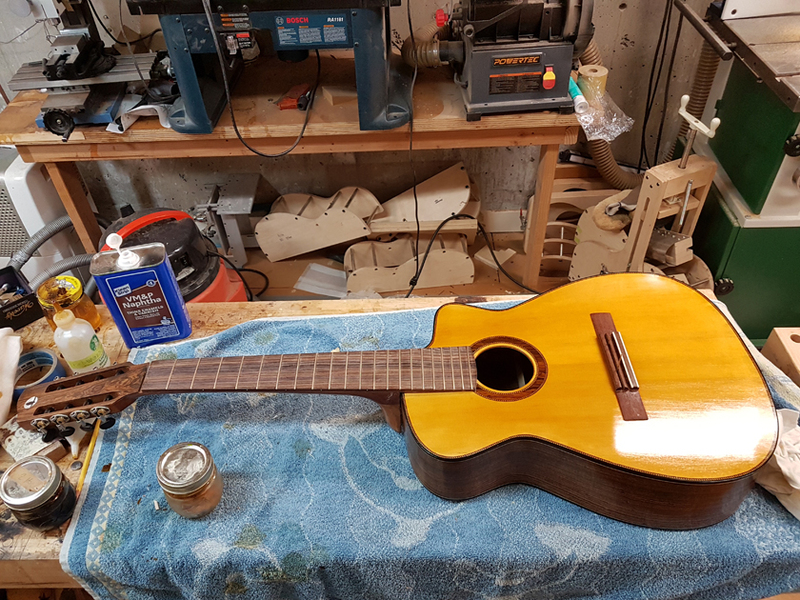 I originally French Polished with an amber shellac hoping to give the instrument an older feel to it but I hated the color and it looked blotchy so I stripped that and sealed with blond shellac and sprayed on the royal Lac. Agree - the blonde looks much better. Great to see this troublesome one finished! John that does look great. Your description of the ret top is also very timely. 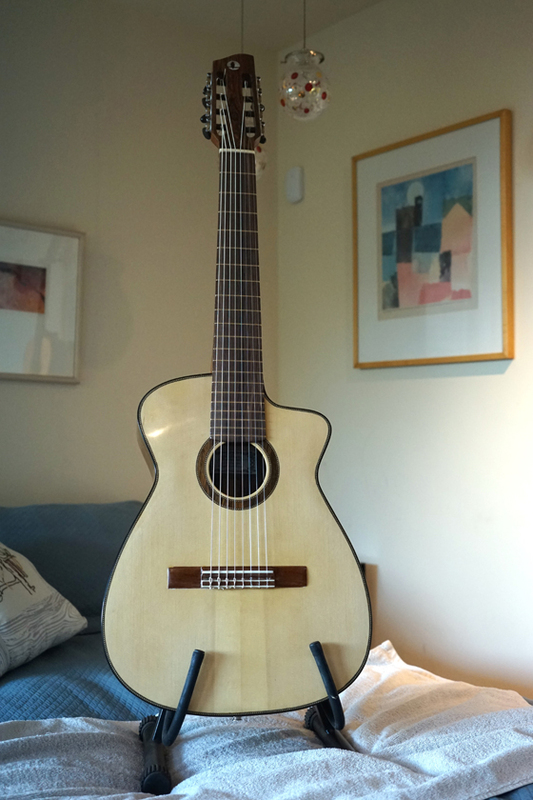 I have a falcate braced classical I completed a while ago that is seriously dull sounding. At some point I intend to re top with far less bracing - in fact the opposite of your job and I shall certainly try your technique. 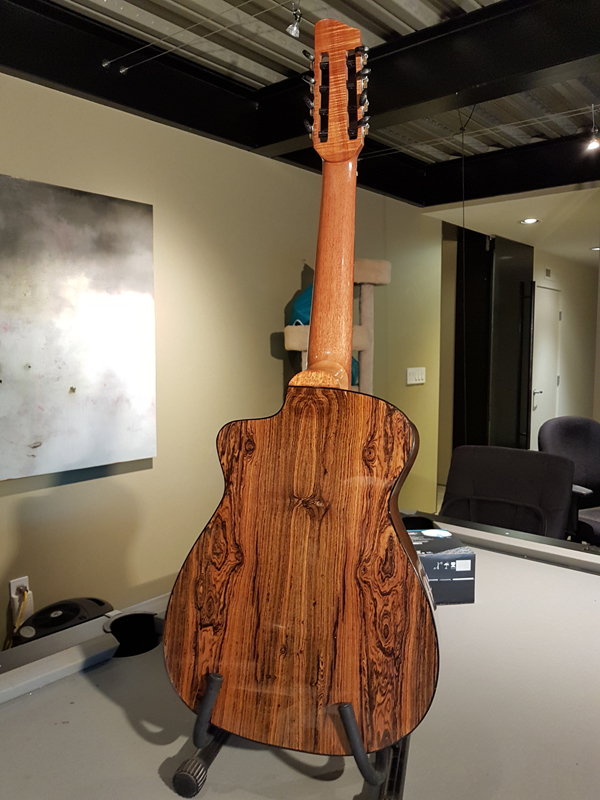 The guitar looks great! 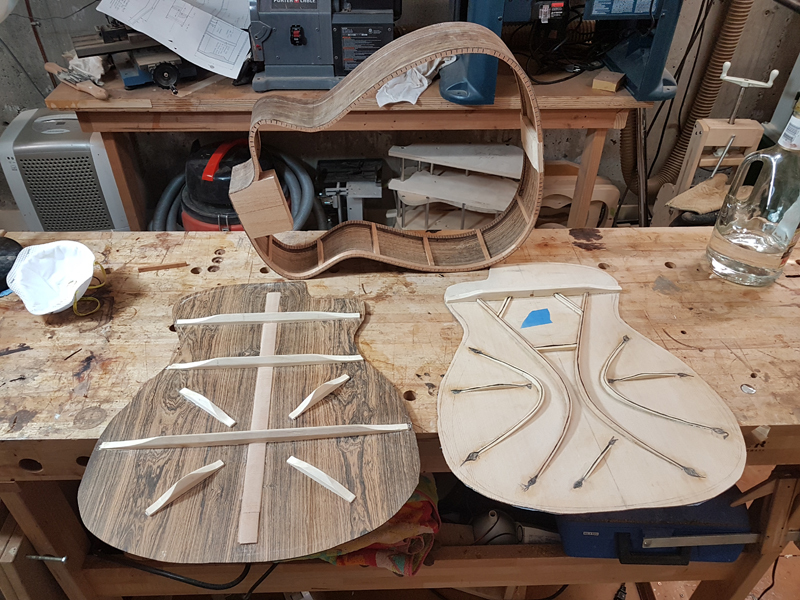 I’d love to hear/play it in person, I’ve been tempted to build seven string dread, in my mind I was going to simply put a extra brace behind the bridge plate like what some twelve string guitars have. ... I shall certainly try your technique. Dave make sure you check out Greven's description as well. 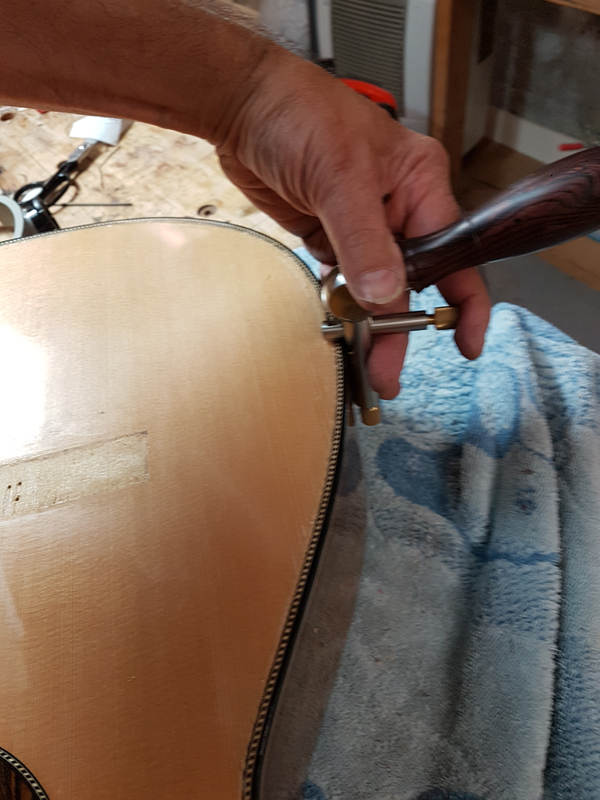 http://www.grevenguitars.com/retopping-demo.html the source I used for the process. Today I handed the guitar off to the young guitarist who had me build it. He was thrilled, he may perform with it next spring in Seattle, if so there will be a professional video I will post.